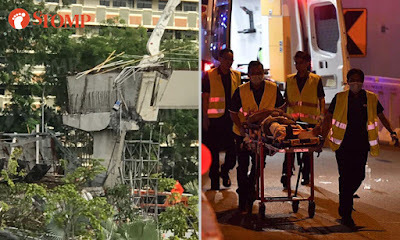 A structure on an incomplete highway collapsed early Friday (July 14) morning near the Pan-Island Expressway (PIE) exit to Tampines Expressway (TPE). The Singapore Civil Defence Force (SCDF) said one worker, a PRC, was pronounced dead at the scene by paramedics, while 10 others have been sent to Changi General Hospital. At around 7am, it said all workers at the construction site have been accounted for and that search and rescue operations had been completed. SCDF was alerted to the incident at about 3.35am, according to a post on their Facebook. The collapsed structure looked to have been about 5 metres high, according to an ST photographer who arrived at the scene at 4.30am. Or Kim Peow Contractor is the firm responsible for building the highway along Upper Changi Rd, but what's interesting is, it is owned by OKP Holdings Pte Ltd, whose Chairman and Directors are grassroots leaders! Chairman Or Kim Peow is in Potong Pasir CCC and was awarded Public Service Awards a few times before. His 3 sons are Directors of the company (surprise surprise!) and were similarly awarded for their contributions to public service. Or Toh Wat is the Group Managing Director and chairs Potong Pasir CC's Management Committee. Another son, Or Kiam Meng, is the Executive Director and Patron of Anchorvale CC's Management Committee. The third son, Or Lay Huat, is a member of Tampines GRC, the First Vice Chairman of Tampines West CCC, and a Treasurer of the School Advisory Committee at East View Primary School. And that's not all ok! Other directors of the company also held senior positions in the public sector. Chen Seow Phun was an MP from 1988 to 2006. He served as Minister of State for Communications, Minister of State for Communications and Information Technology, and Minister of State for National Development. He was Board member with the HDB, EDB, Port of Singapore and Singapore Power Ltd. Another director, Tan Boen Eng, also held senior positions at IRA, Singapore Pools and was a member of the Singapore Sports Council. Whoa don't play play, all big shots sia. How come so many big shots but still cannot ensure safety precautions, still kena fined, still got lapse? What are they going to do about it now that they kena so many accidents? Eh pls la, make sure you run your company properly first before boasting about your involvement in "serving the community"! The contractor in charge of building the affected highway, Or Kim Peow Construction, was fined $250,000 2 years ago for failing to take safety precautions and causing a worker's death in an accident at Yio Chu Kang flyover. In 2015, 4 workers fell when the platform they were on gave way. The accident happened because the company did not check if the platform was properly put up. At the time, the Manpower Ministry said: "This is a clear case of a company that does not take workplace safety seriously". But 2 years later, they're still using the same contractor and look what happened! Shouldn't they be blacklisted especially for a big project like this? What's going on? Anyhow only!